20.10.2018: Round-the-outside pass earns Drugovich win with poleman Siebert (Campos Racing) and Viscaal (Teo Martín Motorsport) flanking him on the podium, the latter scoring enough points to take the vice-championship. Round-the-outside pass earns Drugovich win with poleman Siebert (Campos Racing) and Viscaal (Teo Martín Motorsport) flanking him on the podium, the latter scoring enough points to take the vice-championship. Felipe Drugovich’s audacious passing around the outside paved the way for another victory in the Euroformula Open. 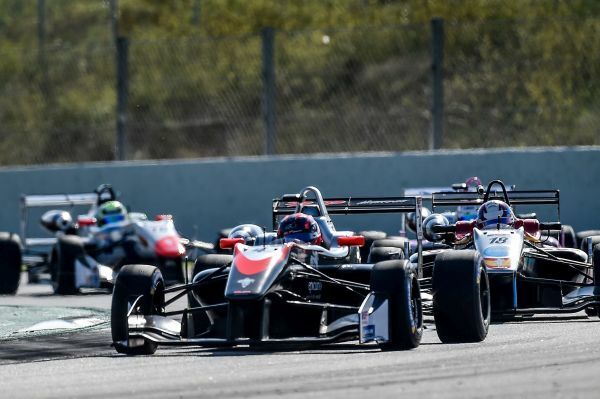 Drugovich continued his dream season in the RP Motorsport-run Dallara F312 performing another faultless performance at the Circuit de Barcelona Catalunya. With Drugovich claiming his thirteenth win of the season, Argentinean Marcos Siebert finished second for Campos Racing. Bent Viscaal (Teo Martín Motorsport) came third to be crowned Euroformula Open vice-champion. Besides, the Dutchman took the Rookies’ class honors ahead of David Schumacher (RP Motorsport) and Lukas Dunner (Drivex). In the morning, Siebert secured pole position for the first race after a breathtaking qualifying session. It was a tough one due to rain overnight but track conditions improved rapidly, therefore making everything hard to predict. Siebert colored purple sectors in the closing minutes of the session to clock a lap time of 1:40.657. Then, a yellow flag prevented others from improving in their final attempt. With Drugovich starting second on the grid alongside Siebert, Matheus Iorio (Carlin) and David Schumacher (RP Motorsport) shared row two. Cameron Das (Carlin) and Viscaal lined up on row 3. Further adrift, Guilherme Samaia (RP Motorsport) posted the seventh fastest lap time ahead of Javier González (Drivex). Finally, Kaylen Frederick (RP Motorsport) and Patrick Schott (Drivex) took the final spots in the top-ten. After two laps, Drugovich sped up again as the safety car headed into the pitlane.The Brazilian driver pulled away with a succession of quick laps with Siebert running solidly in second place. Viscaal moved past Schumacher for third in lap nine and opened a gap on David. A lively battle saw Iorio, Das, Samaia and Dunner fighting for the top-five. After 19 laps, Drugovich took the checkered flag in first place with Siebert and Viscaal crossing the finish line second and third respectively. Schumacher took a strong fourth place with Iorio finally fending off Das, Samaia and Dunner. Series newcomer Brad Benavides (Campos Racing) made it into the points with ninth place ahead of another debutant, Swiss Schott, who completed the points-paying positions. All the action can be followed from fans at home thanks to live coverage by major national broadcasters in key countries such as UK (BT Sport), Spain (Teledeporte RTVE), Portugal (Sport TV), Motowizja (Poland), Central Europe (Digisport), and Russia / CIS countries and Baltics (Poverkhnost Sport), among others. Rookies: 1. Bent Viscaal, 138 points. 2. Lukas Dunner, 90 points. 3. AldoFestante, 50 points. 4. Yves Baltas, 37 points. 5. Dev Gore, 27 points. 6. Michaël Benyahia, 26 points. 7. Leonard Hoogenboom, 18 points. 8. Kaylen Frederick, 17 points. 8. Leonardo Lorandi, 14 points. 9. 10. Raúl Guzmán, 6 points. 11. Moritz Müller-Crepon, 3 points. Frederik Vesti to make his FIA F3 European Championship debut.